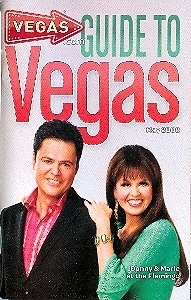 Donny and Marie on the cover of Guide to Vegas pocket book, May 2009 issue. 50 pages, in mint condition. Card size: 3 1/2 X 5 1/2 in. Buyer is responsible for 1.25 postage within the USA and Canada. Please send email if you need additional details. Thank you for visiting my store!